According to the motion, it appears that Mr. Goss, his firm and his clients have tried to defraud some of the rightful owners of approximately 100 acres south of College Station. According to the pleadings and evidence in Gregg Falcone v. The Known and Unknown Heirs of Joshua Washington, Sr., Cause No. 16-000649-CV-85, the firm prepared deeds that omit the names of many of the owners, yet those same deeds purport to transfer 100 percent interest in the property to the firm’s clients. If that sounds familiar to some of my regular readers, it should. The scheme looks similar to the one perpetrated by attorneys Bryan F. “Rusty” Russ, Jr. and James H. “Rattlesnake Jimmie” McCullough in Robertson County with the help of 82nd District Judge Robert M. Stem, and it works something like this: (1) Shell Company A (or Partial Owner A) purports to transfer your real estate to Third Party B, even though Shell Company A (or Partial Owner A) never owned your real estate in the first place; (2) the lawyers file suit and ask the judge to declare that Third Party B owns your property outright; (3) rather than give you notice that you are being sued for your property, the lawyers claim that they cannot find you; (4) the judge allows them to post “notice” at the courthouse where you are unlikely to find out about it; and (5) the judge gives your property to Third Party B. In Robertson County, the FBI compiled several three-ring binders of evidence documenting the fraud, and I know that because I cooperated with the FBI and one of the agents showed me the three-ring binders. 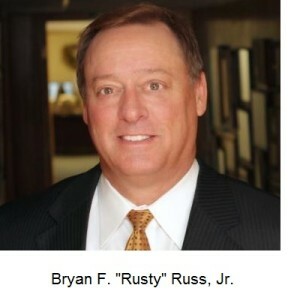 For reasons that I still do not understand, however, the U.S. Attorney’s Office in Waco would never prosecute Mr. Russ, Mr. McCullough, or Judge Stem. In the Falcone case, Judge Hawthorne should have recused himself immediately because the allegedly fraudulent deeds were prepared at his former law firm while he was still a partner. As explained in the motion filed today, if Judge Hawthorne did not know about the alleged fraud while he was a partner at the firm, he certainly knew about it after the lawsuit was filed. Yet he kept presiding over the case even though the law plainly disqualified him because of his conflict of interest. And he did more than preside. According to the motion, he allowed Mr. Goss to serve notice by publication even though some of the rightful owners could have been located and served. In other words, Judge Hawthorne made it far less likely that the rightful owners would learn that they had been sued and that someone was trying to take their land. Furthermore, he only required Mr. Goss to publish notice once in the newspaper, contrary to the rules governing service by publication. When one of the defendants asked Judge Hawthorne to order Jay to provide proper notice, i.e., actual notice, to the other defendants, Judge Hawthorne inexplicably denied the request. To Mr. Goss’s credit, he immediately flagged the conflict and Judge Hawthorne quickly appointed another attorney ad litem, but the order appointing Ms. Beddingfield does not appear in courthouse records. Why not? Judge Hawthorne might claim that he did not know about the relationship between Mr. Goss and Ms. Beddingfield, but the motion notes that (1) the relationship was widely known in the legal community, and (2) Mr. Goss and Judge Hawthorne are personal friends. It is still unclear who the real plaintiffs are in the Falcone case. Mr. Goss switched the parties around, and now Southside Ranch, LLC is listed as a plaintiff. How many local lawyers have an interest in that company or the real estate? Is Judge Hawthorne one of them? 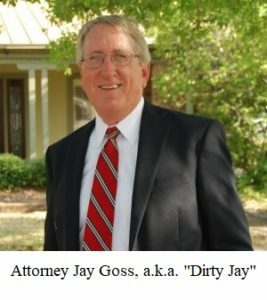 [Update 7/19/2018: Nobody in Mr. Goss’s firm owns an interest in the company, but I am informed that Mr. Goss’s family members owned an interest in the Southern half of the 100-acre tract]. 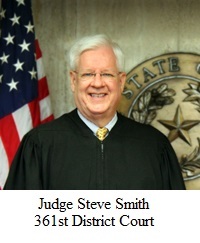 At the absolute least, Judge Hawthorne should have known better than to preside over the Falcone case: He is mentioned by name in In re O’Connor, 92 S.W.3d 446 (2002), wherein the Texas Supreme Court disqualified Judge Randy Michel because he and Kyle Hawthorne were law partners during part of the time that Mr. Hawthorne was representing Ms. O’Connor. 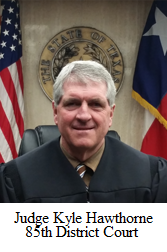 (Brazos County residents may recall that Judge Michel was later forced to resign because he was using his position to do favors for his mistress, an attorney). The rule is very clear: if a law firm was involved in disputed matters while the judge was a partner, the judge is disqualified from hearing that case. I could report all of this chicanery to Brazos County District Attorney Jarvis Parsons, but that would be a waste of time. Mr. Goss’s son Jason formerly worked for him as an assistant DA, and I am reliably informed that Mr. Parsons has previously demonstrated a strong tendency to protect the interests of the Goss family. Of course, I have other options. I could hijack one of Mr. Parson’s grand juries by sending letters directly to the grand jurors, and I’ve hijacked grand juries before. Just ask Texas Attorney General Ken Paxton and Collin County DA Greg Willis. I could also approach the FBI again. The U.S. Attorney’s Office in Waco never lifted a finger against the rampant corruption in Robertson County, but Brazos County is covered by a different office, namely the U.S. Attorney for the Southern District of Texas in Houston. Maybe they will have a different attitude toward white-collar crime and judicial corruption. In my original July 9, 2018 blog post, I mentioned a colleague by name without his permission. I have since deleted his name and apologized to him. He was furious with me, and understandably so, because he feared that Judge Hawthorne and Judge Smith would retaliate against him since he is a friend of mine. Apparently his fears were justified. He told me he tried to meet with both judges to explain that he had nothing to do with my last blog post (a fact that I had noted in that blog post). My post never mentioned him in connection with Judge Hawthorne or Judge Smith, but he said both judges were angry and refused to talk with him anyway. I suppose I should have expected that, especially from Judge Smith, who is renowned for his pettiness and vindictiveness. I’d rather not waste my time on a couple of state judges in Brazos County, but if they think they’re going to intimidate me by retaliating against my clients and friends, they’ve got another thing coming. If they’re smart, they will leave my friends alone, leave my clients alone, and leave me alone. Just ask former U.S. District Judges Walter S. Smith, Jr. or Harry Lee Hudspeth if I am afraid to fight a crooked judge.